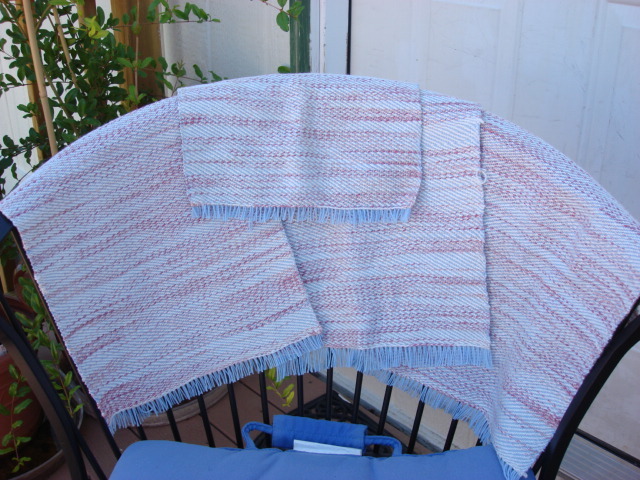 These are towels and a washcloth I made with my new loom. They were supposed to be place mats but I screwed up in two ways: one, I didn’t wind on enough warp to account for the loom waste (even though I knew I would need it) and two…. That’s a section of warp you see there…I somehow completely managed to miss warping it when I warped the loom! So there’s three yards of wasted thread! It made may project about 1.5 inches narrower than I had planned — and I was thinking to myself before I discovered it “Dang, there’s a lot of draw in on this loom!” Uh…not so much. Operator error. 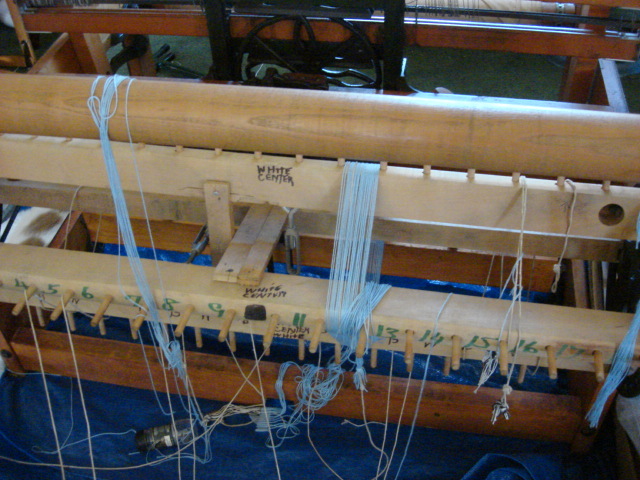 I really would like to get the other cams for this loom. I have been in contact with the owner of the company; we are all waiting for the foundry to finish the other cams in order to get them shipped out. That could take a while though, so if I want complex patterns I’ll have to settle for the smaller loom with more options. I have to buy a new apron for Mabel, and an apron rod. The apron is a band of fabric tacked to the front beam that holds the woven fabric. Mabel’s is dry rotted and began tearing when I put tension on it. This happens, but I was hoping to get more than one project out of it before it was done. Alas, it was not to be. I still need to get more treadle hooks (they connect the treadles to the parts that make the design) for my Macomber, I don’t have enough to do any of the really cool complex patterns I want to try out. The neighbor’s grape vines are loaded down. I made grape jam yesterday, and will be making grape and blueberry jellies today. I hope the apricots are ripe soon, and found a plum tree in the neighbor’s back yard that he wants nothing to do with. It’s going to be a good year for dried fruit! We don’t have a single pepper yet. I looked at last year’s garden journal and we had peppers by June 21. This year has been so weird! We’re just now getting a crop of tomatoes, no peppers, no green beans to speak of, and few raspberries.